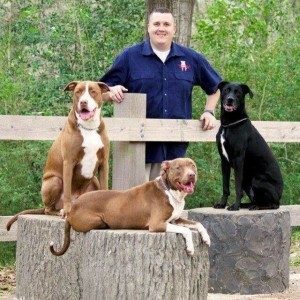 Born and Raised in Houston Texas, Greg Needham has had a love for dogs for as long as he can remember. He begin rescuing stray dogs at an early age and had dreams of opening an animal shelter to help dogs in need. However at the age of 12 years old he was violently attacked by an Aggressive German Shepherd / Chow Chow mix. This attack left not only permanent physical scaring but created an extreme fear of dogs for the years that followed. Over time Greg learned to overcome that fear and found an ability to relate to owners whom themselves are fearful of their own dog. 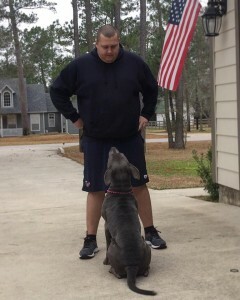 It is from this attack that Greg works diligently and places great value on the safety of dog training and bite prevention between children and dogs. This is shown through his training methods of incorporating the entire family in the training process. Helping families create a happy, loving, obedient , loyal, family dog is the goal. Greg began his career working and volunteering with different Trainers who have a great varying of approaches and styles of dog training. Working with the various approaches to training allows Greg the ability to adapt to each and every dog and understand what methods you and your dog will benefit from to achieve the desired goal of training. Greg Needham has trained hundreds of dogs in the Houston area as well as traveling to Dallas, San Antonio, and Baton Rouge in order to assist families with their Training needs.